On Monday 10/26 we completed the WWWP 5K challenge. My wife and I hiked the Lakeside Loop trail at Rocky Gap state park. This 5.3 mile hike was certainly challenging. Walking on all those rocks and tree roots covered with leaves was a challenge itself not to come back with broken ankles. It was a wonderful hike but I walked too much that morning out shooting photographs. I woke that morning to a cool feel and when I looked out before sunrise I could see the fog rolling off the water. It was beautiful but obscured the color of the season. But there were a few treasures out there that morning. One of them were our winged friends coming to life. 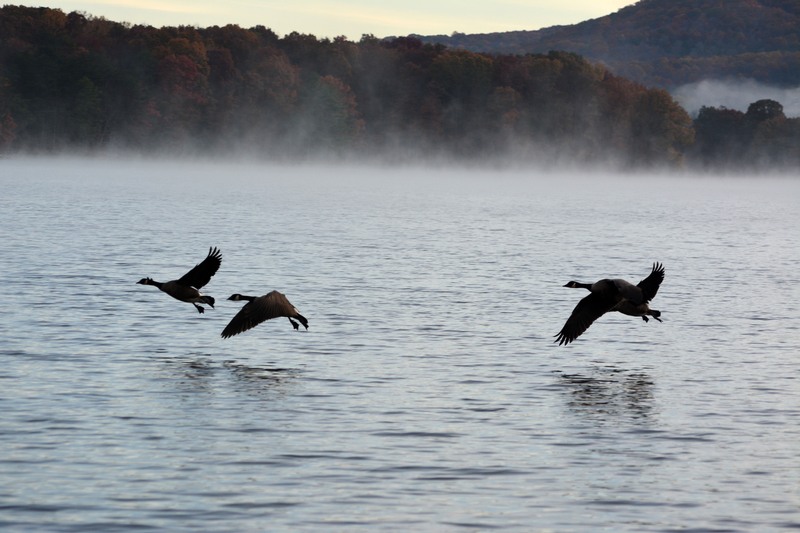 Both geese and mallard ducks were taking their morning flight and searching for breakfast. 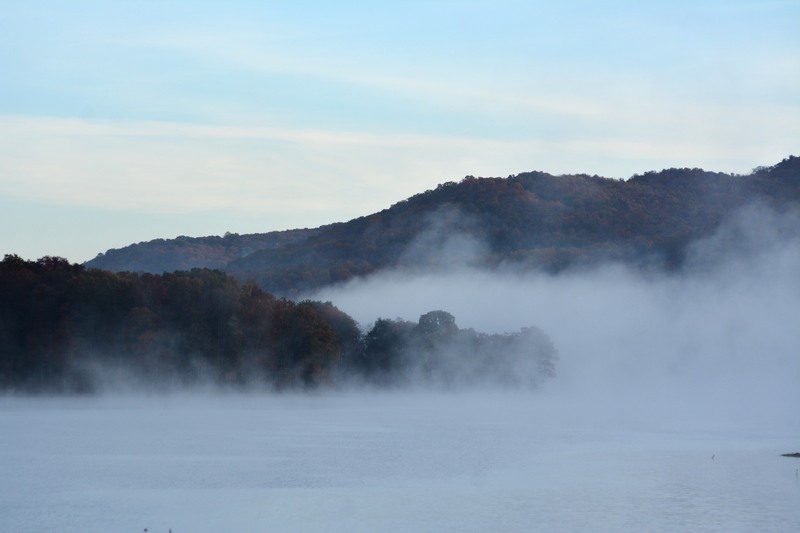 The mountains in the morning were just beginning to peak out with the sunrise but still partially covered by the mist from Lake Habeeb. I bet I covered a few miles that morning even before thinking about the hike. I know it was too cool for the shorts I had on but walking briskly kept me warm for short burst. 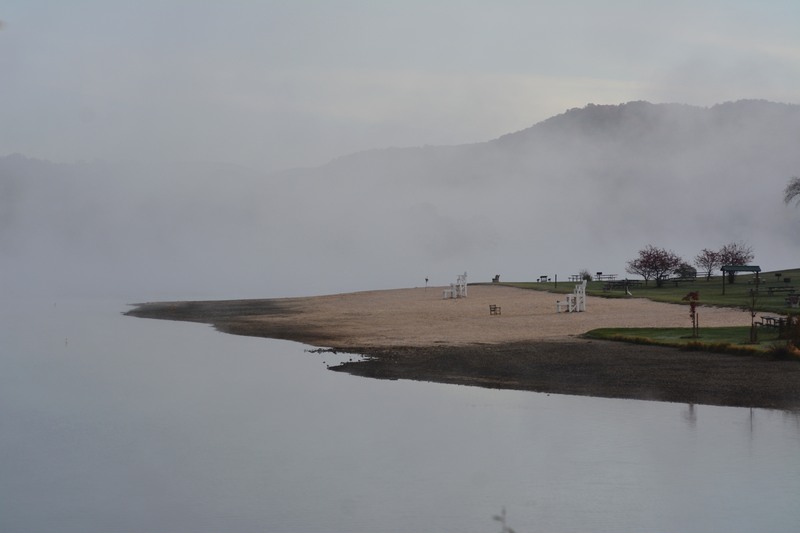 Morning mist from Lake Habeeb. So while freezing my behind off I strolled over to the beach off the state park. I wandered around the Rocky Gap resort where we were staying and walked a few holes along the golf course on the south side of the lake. It was a wonderful morning and just the exercise I needed to start my day and work up an appetite for the breakfast buffet we were going to later that morning. I didn’t feel like I was doing too much. As a matter of fact I intended to do that Lakeside Loop trail twice that day but that thought was quickly dismissed upon returning from the first trip around it in the afternoon. I was glad I got a chance to shoot both that morning and afternoon on the walk because Tuesday was pretty overcast and was just getting worse with rain on the way. I really should have done a few more miles in the morning because I don’t usually have this scenic view and weather to awe me where I’m at. So this was a treat despite the cool temps and lack of a good sunrise. But my stomach took control and said get back to the room, wake up your better half and take me to the food distribution point. And as I have done too often in the past, I listened to that part of my body and cut the morning shoot off after an hour or two of wandering the area. One thing I love about this place is the tranquility. I know it’s hoping during the summer season at the park but a weekday morning in fall it was quiet as could be which is what we were also looking for in a relaxing trip. When we started the walk it was pretty cool out still. I put some sweats on but by the end of the walk I was wishing I had shorts on. Also by the end of it my feet and shins were barking at me. No problem, a night of rest and I’m ready to go again. Unfortunately we are no longer at that wonderful site. 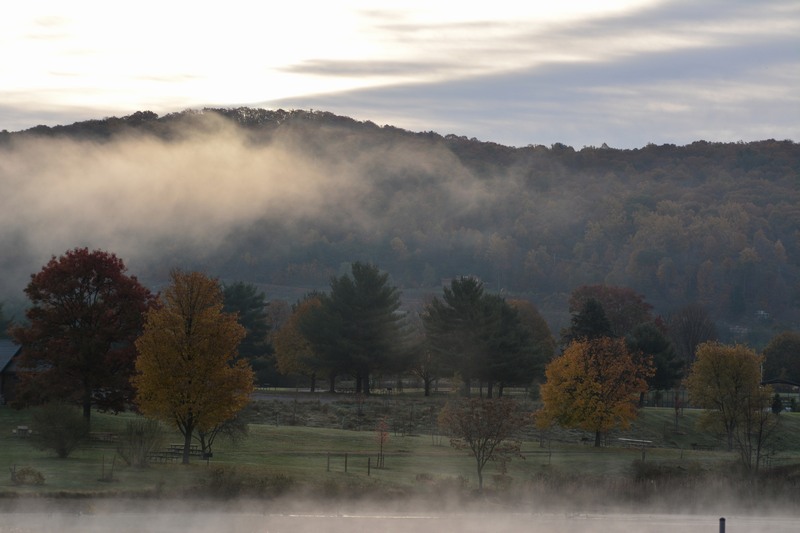 (Rocky Gap Resort and State Park which is just a few miles west of Flintstone Maryland). We took a few days to celebrate our 35th anniversary there, but are back to reality and the treadmill. So instead of boring you with more words I’ll share some of the pictures from my afternoon stroll and sights we saw. I feel good now for having done that and I’m hoping I can keep a few good lengthy walks in my workout each week through the difficult winter season. So I hope you enjoy the images of some of the paths, lake and wildlife. Categories: Maryland, Photography by Mike Hartley | Tags: Maryland, photography, wwwp5k | Permalink.